According to VesselsValue, rising oil prices have drawn more eyes to the offshore markets. There are signs of green shoots after a period of depressed sentiment that started in late 2014, pushing asset values downwards through 2016. VV's Fixed Age Values for a 5 year old Jack Up Rig has increased 36% from Jan 2017, when a vessel was worth US$69.9 million, to US$95.14 million today. E&P spending should start to increase now that oil prices have shown a sustained period of strength, increasing demand for offshore equipment. Much of the spending will be directed to onshore exploration, but a portion will be directed at easily accessible offshore projects. This should benefit jackup rigs first before a market rebound for deepwater assets (Drillships and Semisubs). The increase in oil prices is driving speculative interest in the market for Jackup rigs, and has helped boost the values of these units. 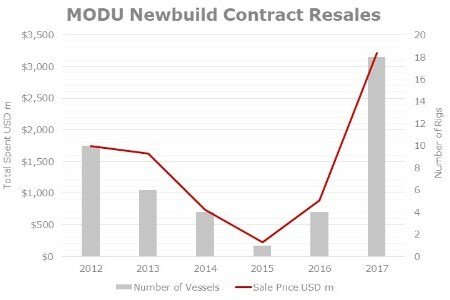 While no new MODU newbuilding orders have been placed since July 2015, the resale market for Jack Up Newbuilds has increased over 2017. 18 newbuild rig contracts were resold, compared to a total of 25 resold in the five years previous. The majority (86%) of these resales since 2012 have been Jack Up rigs, with only a handful Semi-sub rigs or Drillships.